New Signup | Forgot Password? If you own or want to download songs for the MeraGana Karaoke Studio Microphone then you have come to the correct website. You can download KAM files of the songs of your choice for the MeraGana Karaoke Studio Microphone. 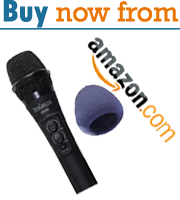 MeraGana HandHeld Karaoke (Sing along) Studio Microphone (with 1,000 Indian Songs) songs on SD card. (Songs are not built or embedded in so that songs can be changed and added the way you want, as per your choice).